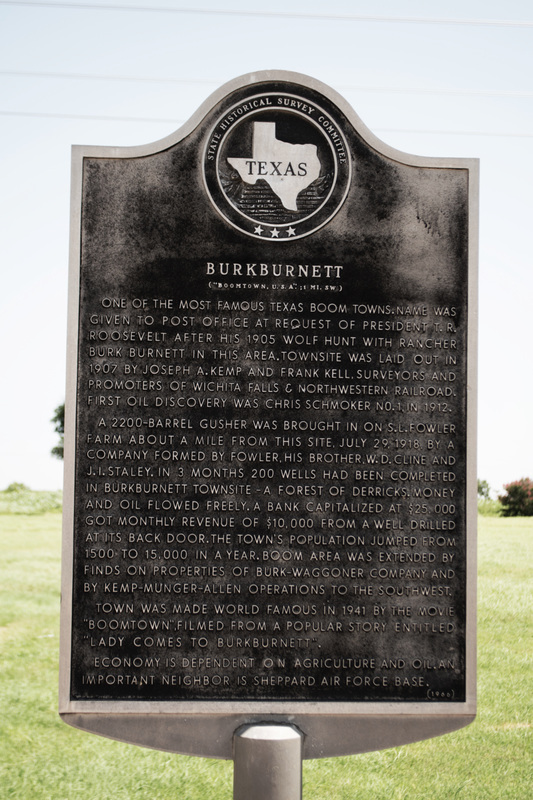 One of the most famous Texas boom towns, name was given to post office at request of president T. R. Roosevelt after his 1905 wolf hunt with rancher Burk Burnett in this area. Townsite was laid out in 1907 by Joseph A. Kemp and Frank Kell, surveyors and promoters of Wichita Falls & Northwestern Railroad. First oil discovery was Chris Schmoker No. 1, in 1912. A 2200-barrel gusher was brought in on S. L. Fowler Farm about a mile from this site, July 29, 1918, by a company formed by Fowler, his brother, W. D. Cline and J. I. Staley. In 3 months 200 wells had been completed in Burkburnett townsite - a forest of derricks. Money and oil flowed freely. A bank capitalized at $25,000 go monthly revenue of $10,000 from a well drilled at its back door. The town's population jumped from 1500 to 15,000 in a year. Boom area was extended by finds on properties of Burk-Waggoner Company and by Kemp-Munger-Allen operations to the southwest. Town was made world famous in 1941 by the movie "Boomtown," filmed from a popular story entitled "Lady Comes to Burkburnett." Economy is dependent on agriculture and oil. An important neighbor is Sheppard Air Force Base. Located on Third Street, off Exit 14 on IH44, Burkburnett, Texas. GPS: 34-degrees 06' 3.7" N -98-degrees 32' 51.2"W.
For information about Burkburnett at the Handbook of Texas Online, click the button below.